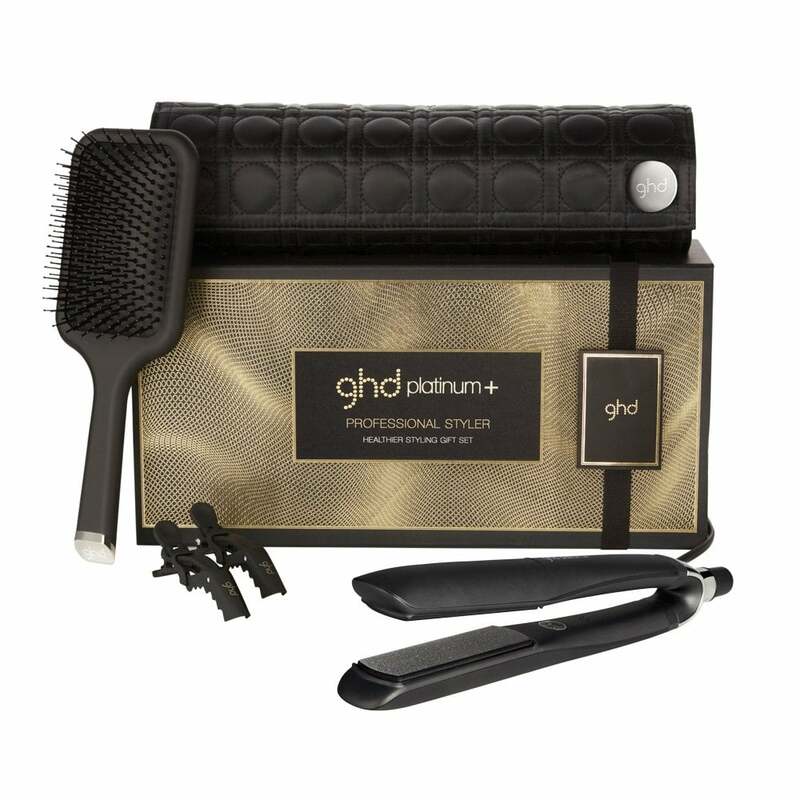 ghd&apos;s Healthier Styling Platinum+ Styler Gift Set is the ultimate gift this Christmas! This gorgeous gift box contains a complimentary selection of ghd&apos;s best-selling products, including their iconic Platinum+ Styler, which is sure to go down a treat under the Christmas tree. 1 x ghd Platinium+ Plus Styler Black - delivering exceptional, salon-professional results, this styler is the go-to product for countless professionals across the country. Ultra-zone® plates with predictive technology recognise each section of the hair, monitoring the temperature over 250 times per second to control & adjust the heat as required, resulting in 70% less breakage and 2x more colour protection when compared with a standard styler working at 230°C. Advanced, precision-milled plates with an ultra gloss coating glide effortlessly through the hair to deliver instant, frizz-free styling with 20% more shine vs naturally dried hair. The wishbone hinge allows for unrivalled control and perfect plate alignment. Perfect for use on all hair types, this straightener is suitable for worldwide usage and shuts off automatically after 30 minutes of non-use. Supplied with a UK three pin plug & 2.7m salon-professional swivel cord. 1 x ghd Paddle Brush - the perfect tool for effective styling on medium to long hair. Detangle longer lengths without generating static, create straight and sleek blow-dries or smooth hair into ponytails and updos! The ergonomic handle has a non-slip finish for ultimate styling control. 2 x ghd Sectioning Clips - with a soft but firm grip, the clips hold back any hair type to allow for freedom of styling with a styler, hair dryer or curler. 1 x ghd Heat-Resistant Plate Guard - perfect for protecting the ghd Gold Styler. 1 x ghd Heat-resistant Roll Mat - matte quilted satin on the outside combines with heat-resistant lining on the inside, allowing you to stash away your styler as soon as you switch it off. Justmylook is a fully authorised ghd stockist and the styler is guaranteed for three years. Review Summary - 4.9 out of 5 based on 15 ratings. Fantastic service, delivery was really quick. I can’t believe the difference Platinum+ have made to my hair in comparison with my old ghd’s. I have curly, coarse hair and these leave it feeling soft and smooth. Fantastic, extremely happy. I usually use the thicker ghd’s as I have long think hair but these are great I my hair and with practice I’ll be able to curl it too which I’ve never been able to do with ghd’s previously. Bought for Christmas so can’t review product but seems a very good price and very quick delivery, would use company again! Prompt delivery. Good price and product what you would expect from ghd.